Money in the Garage: Trash to cash....again! Good for you! I admire your nerve, stealth and resourcefulness. I might not have had the nerve to go back for the arch. So go on you. Nancy-My keen trash picking skills have been honed over many years, going back to when I was a paperboy. Someday I'll share some of those ancient stories-HA! Thanks for the props....Dude! mrs4jachi- Cannibalizing- a great idea! You're are on to something there. And jeez-louise, $30 for the seat cover? Sounds like you could specialize in just that stuff. Thanks for sharing, that's awesome ....Dude! Now that is awesome mrs4j!!!! I think you should vote that guy Neighbor of the Year! :) I see those things at garage sales all the time for much less than $40. I will definitely be giving them a second look. Kim- I do talk to him, nice guy, but very wasteful that way. You may be right, I should say thanks HA! Let me know if you have success flipping a saucer. I'd like to see if this was an one-time wonder, or the real deal. Also see Mrs 4jachi's comment above, sounds like she's on to something.....Dude! Have cannibalized several saucers myself. The seat covers are the best but Evenflo toys (the ones that attach to the saucer) are interchangeable and typically sell for around $10-$15 each. CRSaver-That's pretty good. It's really an eye opener what people have cannibalized" and re-sold. It's a whole separate business that many folks seem to do well on. Thanks for sharing your tip....Dude! hey Dude, I belong to a facebook group called "dumpster divers/trash pickers United States. Members DD for food and things they can flip and you rank up there with the best of trash pickers. Wasn't even sure if you do FB, but just thought I would throw it out there if you want an invite to our "club". You need to watch youtube, "mom the ebayer". She is one heck of a trash picker herself and the moderator of said FB group. oliveoyl64 - Thanks for the referral. I am not in FB, but have ways to check it out, which I'll do. WIll also find that youtube piece. I am also following a blog called, http://garbagefinds.com/ The guy is up in Canada and pulls some incredible things out of the trash! If you haven't already, you should check it out. Thanks for the compliment about my garbage pickin skills. I'll wear it with pride! ; ) ....Dude! I posted a link to your blog on the dumpster diving page. Thanks for the link to garbage finds. That would be a FUN road trip, EH? Thanks for posting the link. I've seen an uptick in new readers. And yes, that would be a fun road trip. The stuff that guy finds in the trash is amazing! I have never flipped an exersaucer but what stood out to me in your post is your photo of your neighbor's trash. First I hope he doesn't read your blog and second is that I am starting to wonder if you live in the arctic circle. I don't know where you live, but did you really still have snow on the ground until just recently? Check the second paragraph. He said this wasn't long after the first blog was posted, which was in January. So this probably was in February. This area had snow until April. As for the neighbor reading this, I wouldn't care about that other than him potentially not throwing out any more treasures. Sean (below) hit the nail on the head. I pulled the Exersaucer from the trash around February, not long after rescuing the stroller and high chair. I don't want to overload readers with too many consecutive trash picking stories, so I decided to sit on the story before blogging about it. 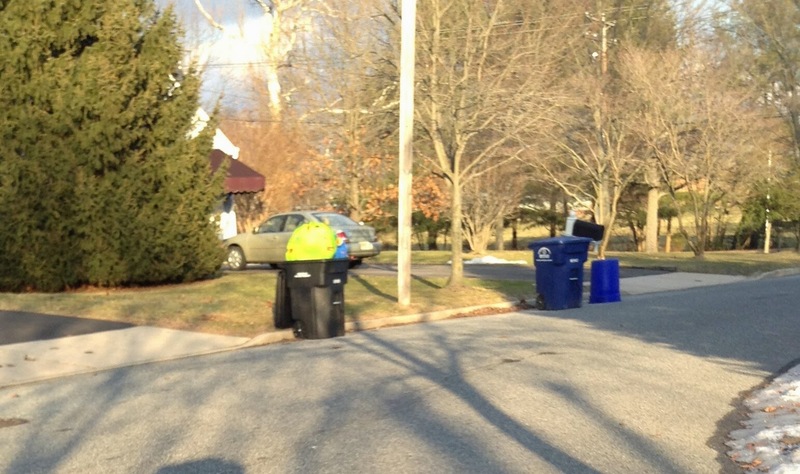 As for the neighbor reading about his trash being turned into cash, not too concerned about it. When he's putting stuff down at the curb for all to see, I think the he doesn't care what happens to it. Thanks for checking out the blog....Dude!